A solid day's trade meant a strong finish for the two day Goffs UK Autumn Sale as today’s Horses-in-Training Session produced significant increases on the corresponding session last year. Today’s HIT average increased 42% on last year’s figures to £11,445 while the turnover nearly doubled, growing 93% to £1,716,700 with five fewer horses offered. Godolphin’s draft of 32 horses produced the sale’s top lot with their four-year-old Wolfcatcher (Lot 307) selling to Ian Williams for £78,000 while Friarstown Stables' last start winning two-year-old Catch A Wave (Lot 281) was knocked down to Debbie Mountian for £70,000. This year’s £300,000 Goffs UK Premier Yearling Stakes winner Stormy Clouds (Lot 270B) made £60,000 to the bid of Howson & Houldsworth Bloodstock and Loughanmore Farms Ballyhome (Lot 349) shared that price when selling to A&K Plastics. 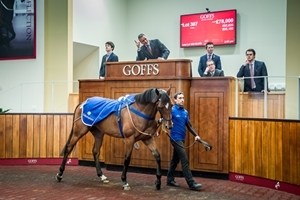 “Today’s Horses-In-Training Sale proved, yet again, that we will return outstanding prices for this category when we have the horses to promote as we have enjoyed a lively trade for the wide variety of flat and NH horses offered, none more so than the large Godolphin draft and several of the Point-To-Pointers that travelled across from Ireland. Indeed, the sale was attended by a large crowd of buyers from home and abroad leading to multiple bidders on countless lots throughout the day. “No one ever pretends that the Doncaster Autumn Yearling Sale is the most high profile or prestigious sale of the year but it does fulfil an important function for breeders. Yesterday followed recent market trends with a selective trade although, as is the norm, there was plenty of competition for those that held the most appeal.